mindfully-designed to strengthen and tone the entire body. We've created a challenging and safe workout that offers focused attention to each individual client. ​We employ a contemporary approach rooted in classic time-proven methodology and incorporate the latest understanding of physical therapy technique. Our teachers are highly-experienced and educated, with advanced training by the best institutions and specialists. The Pilates Reformer can be used for all different body sizes and differing skill levels. You will lay, kneel and sometimes stand on the carriage to target muscles throughout the body and deep within the core. In the fitness industry, the pilates reformer is widely recognized as one of the best methods of exercise, often used by professional dancers and elite athletes to help build strength and increase flexibility. "I have been a member at Energy for about 4 years. I really love coming to Energy. There is a positive and warm and caring atmosphere here, and also lots of FUN! The staff knows your name almost immediately, and is welcoming every time you enter. In January of this year I started taking reformer with Jennifer once a week. It really has made me stronger than I thought I could be, and has changed my body. I feel like Jennifer knows where I am at physically and knows how to push and encourage me to get stronger and work harder each session. On top of being a great teacher, she is beautiful inside & out!" 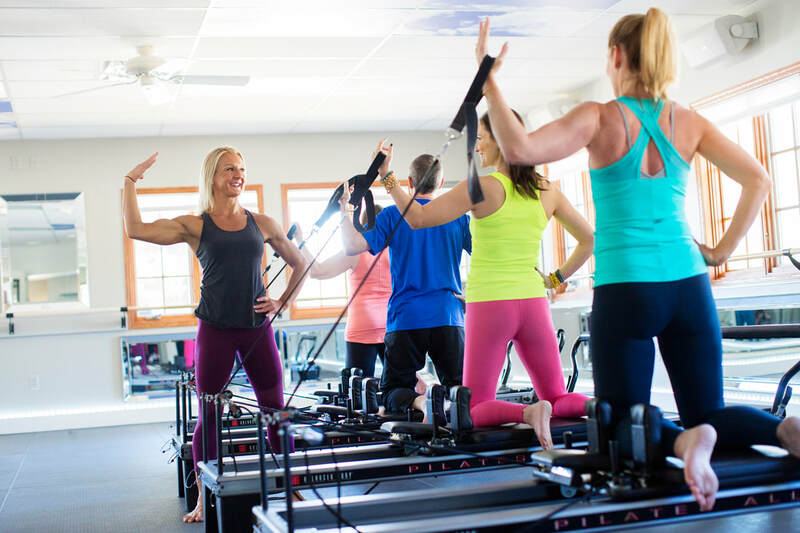 PURCHASE "4 WEEKS TO FIT"
Our small group training sessions are a fun and affordable way to enjoy the benefits of the Pilates reformer machine, while practicing with a group of up to 4 other guests. Bring an old friend or come to a session prepared to make a few new ones, you'll be smiling, laughing and sweating together during your session. ​With smaller class sizes than our competitors, we're able to offer personalized attention to each student, so you're guaranteed to get a challenging workout, suited to your individual needs and ability level. Group packages can be used toward any group training sessions at Energy. We require some pilates reformer exerpciene before jjoingg a group class. If you would like a free demo class, just email us: info@energypilatesfitness.com. "After having three kids, I thought I would never see definition in my abs again. Although I saw great results from group fitness, adding Group Reformer to my routine was the edge I needed to get to where I wanted to be (and my husband noticed too!). Doing Group Reformer with Jennifer once a week gave me quick results in my core and best of all, I LOVED it! I appreciate the low impact sessions that are always different. I love the challenge of working on a new move and adding more tension. I love the sore feeling I get deep in my core the day after doing reformer. I am hooked!" - Mari B. BONUS: SOME SESSIONS ON THE SCHEDULE OFFER CHILD CARE! $7 drop in. See online schedule. Designed for dancers ages 11 to 17. ​*Photo below of actual client, Lauren, age 13. Student at St. Paul Ballet; weekly training for one year.